The strategy of embracing the digital technological world with all its manifestations is widely exercised across different platforms and businesses to boost sales and attract more clients, monetize their activities and reap a good profit. It is especially true for the beauty world targeted at millions of people and aimed at selling products and accessories of their luxury beauty and health – related brands or their professional services. Greeting the client with hospitality and afterward see her off holding her head up with pride and satisfaction after you or your specialists have given the latter a super makeover, haircut or massage can be a thrill. The tricky thing here is how to persuade him or her to choose your salon or spa center among hundreds of other businesses. That’s the question where interactive and image – based website comes into play at its full potential. Nothing works more productive and persuasive than the results of your hard work showcased in your photos and images, nothing saves the client’s time more than scanning all your information available on your website and get in touch with you for respective bookings. And these are only some out of boundless advantages your online profile can grant you with. Apart from the above – mentioned facts that speak in favor of your clients and customers, a website has also another beneficial side, this time for the target business owner, beauty consultant or specialist. From working on a tight budget to gaining more digital recognition, from saving your financial means to hire additional marketing managers to spread a word about your business and your proficiency in your industry, your website will be a great assistance for you in any case. In this relation we at SKT themes have analyzed the given beauty – related trends and tips as for the current world and directed our efforts in the right stream to generate Beauty Spa Lite as respectable and authoritative, tried – and – true free beauty spa WordPress theme for all those beauty centers, makeup and nail salons, spa and massage centers, beauty consultants and trainers who are eager to display their skills and mastery in an elegant and sophisticated way. Being multipurpose at its core, Beauty Spa Lite can also be victoriously used to cater to another feminine and girly undertakings or businesses that any woman entrepreneur or girl boss can be provokingly engaged in. Hence, if the modification of your beauty or spa center has been done at a local level taking into consideration specific local culture and trends, your website based on this free beauty spa WordPress theme can extend your working borders and incorporate also other practices to broaden the sphere of your influence leading to more and more prospects and leads. If we make an in – depth qualitative decomposition of this reputable and faithful, premium quality, yet free beauty – centric WordPress product, it will strike our eyes with its compact and accomplished nature, each and every integral part of it has been updated to stay firm and highly functional for any occasion. From neatly arranged home, about services and other sections are waiting for your dynamic and easy to digest content to hold and represent in an easy to find way. Contact us section is designed to be the informative center of your online profile whenever your potential clients or future partners want to establish a mutually beneficial cooperation with your company. 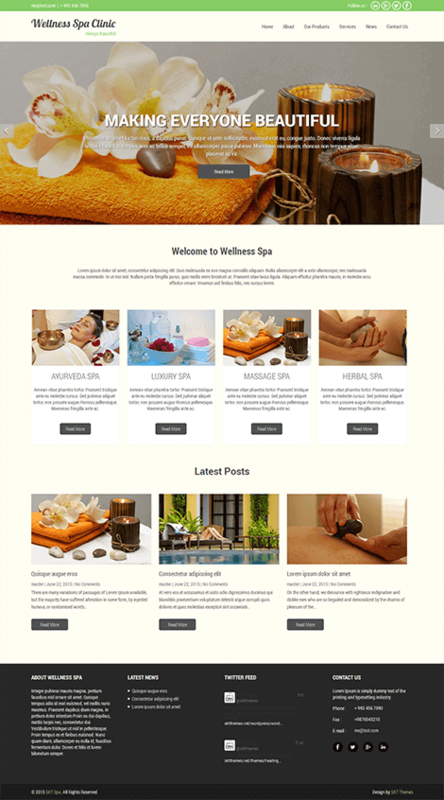 This functionally advanced and strong while truly simple and lightweight free beauty spa WordPress theme is not only user and admin – friendly enabling him to manipulate his or her website from top to bottom right from the backend of the theme, but also totally scalable. It means that you can rely on this free template in the initial stage of your work with limited financial means and then upgrade to its premium version without complex procedures or bewildering requirements. To put it short, you are the only master of your website at any level of its progress and development. 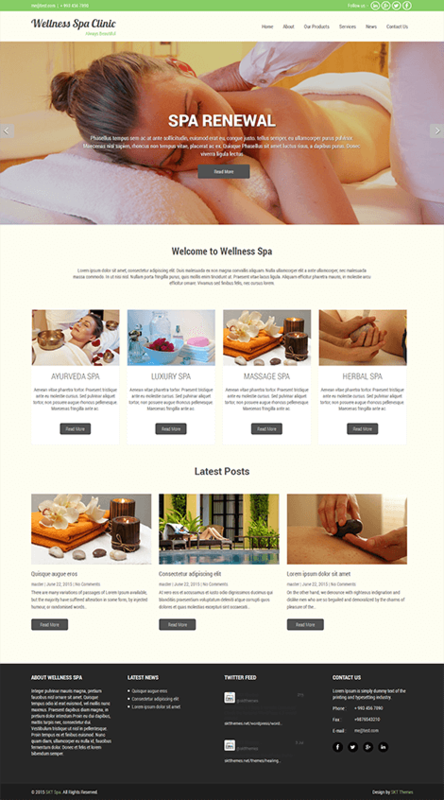 Additionally, you can use this free beauty spa WordPress theme as it is or put your specific touches across your content to be more attention – grabbing with unique style and taste. You can freely change the colors of links and hover to create a cohesive beauty experience, manage the homepage default slider and add up to 5 different images to demonstrate your works and offers and focus the website visitor’s attention on them while there are making snap judgments on your business. In case e – commerce supportive nature is a must – have for your profile, then this template is ideal for you with WooCommerce and other plugins compatibility as well. Totally compliant with the latest version of WordPress and all its claims, as well as equipped with modern and practical Customizer, this free beauty spa WordPress theme celebrates seamlessly manageable theory behind it so that any admin will have the capacity of live previewing any required change to his template. No worries about the responsiveness of your content or your website’s neat display on mobiles and tablets. It will be sorted in seconds with Beauty Spa Lite thanks to the readily mobile – friendliness with HTML 5 and CSS 3. Hence with this checked and confirmed theme you will be provided with one and only web design eliminating the need for creating separate mobile version and looking fantastic on diverse desktops, mobiles, devices and everything in – between, whether it is of today’s or tomorrow’s device. This amazing reaction to the dimensions of the user’s screen will origin valuable mobile user experience which is of utmost importance for traffic consumption. The main science and art of driving the right traffic to your website has not been omitted in this free beauty WordPress theme either. Thus Beauty Spa Lite is armed with all the essential SEO touches and coding to be loved by the relevant search engines and occupy top positions when it comes to search query results. All in all, it is one of the main and cost – effective marketing techniques to grab more market share both from desktop and mobile bandwidths.